A slowing rate of decline across all sectors of the Dubai real estate market suggests increasing stability and the expectation of the market ‘bottoming out’ before the end of 2017, according to leading international real estate consultancy, Cluttons. Cluttons’ Dubai Spring 2017 Property Market Outlook reports that despite the persistence of market corrections in Q1 2017, average residential prices have moderated by 0.9% with the annual rate of decline slowing from -8.8% at the close of 2016 to -7.8% at the end of March. Increasing supply, changing demand for executive positions in the employment market and increasing rent moderation are all expected to continue to impact the residential market during 2017. 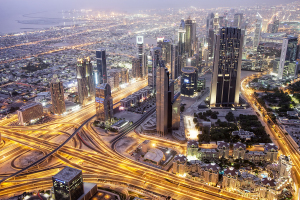 In the Dubai office market, the planned introduction of VAT on January 1st 2018 is already causing a nervousness amongst existing tenants, the Cluttons report finds. As referenced, values across Dubai’s freehold residential areas slid by 8.8% in 2016, largely in line with Cluttons’ original forecast for the year of -10%. This signals the market’s weakest annual performance in five years, and sits 28.7% below the Q3 2008 market peak. Part of this overall market weakness lies at the top. 12 of the 32 submarkets monitored by Cluttons registered price declines during Q1, with the Burj Khalifa tower (-6.9%) leading the price falls. Over the last 12-months, the Burj Khalifa has registered a 25% correction in values, making it the weakest performer across the city. Hattan Villas at The Lakes (-13.5%), Hattan Villas at Arabian Ranches (-12.6%), villas on the Palm Jumeirah (-12.3%) and apartments on the Palm Jumeirah (-11%) rounded off the list of the five weakest performing markets over the last 12 months, the Cluttons report finds. Cluttons’ report stresses the combination of VAT uncertainty and market pressures being faced by the city’s office market, which has remained relatively unscathed by the deteriorating global economic conditions. The Cluttons Dubai Spring 2017 Property Market Outlook reports that rents across most of the 24 submarkets monitored remained relatively steady throughout 2016, following strong growth in the preceding 12 to 18 months. However, global economic anxiety and a subsequent scaling back or delaying of short term expansion projects, particularly amongst international corporate occupiers, has begun to impact on the resilience of rents. All rights reserved to the initial publisher for Wealth monitor.